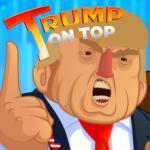 Trump Tower Defense is an amazing tower defense game which is playable friv action game. In this game, you have to protect the US border from evil Canadian invaders who are trying to steal your precious Trump coins. You must build an array of towers to destroy the invaders and protect your horde of coins. There are different types of attacking towers, and you must select the right one to defend against specific unit types – some are stronger than others. The 3D graphics are awesome, and the tower gameplay will keep you on your toes. There are five different levels to complete – can you finish them all and fend off Canada?